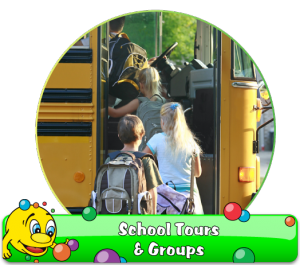 School outings are the highlight of a child’s calendar and at Chuckies we have facilitated many school tours over the years. It is an ideal venue for young children where a high level of supervision is required as child safety is our No. 1 priority. Our aim at Chuckies is to provide a challenging play environment for the kids where they can learn new skills in a fun way. We also provide support for Teachers/Carers who are supervising the children so that it is an enjoyable and stress free outing for everyone. Download our Schools and Groups Brochure. If you would like more details on our School Tours Package, please contact us by ringing 021 4344112 or email us at play@chuckies.ie.